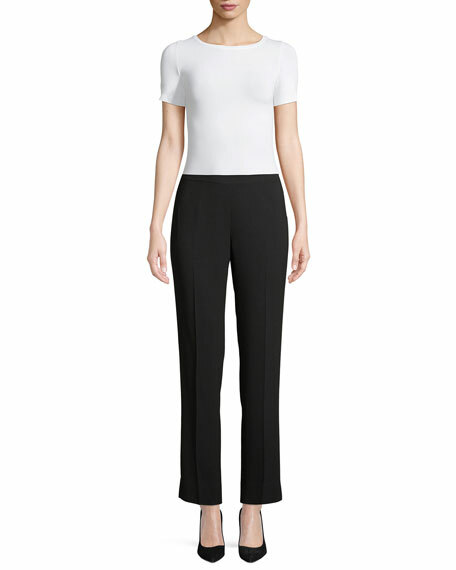 Lafayette 148 New York stretch-twill ankle pants. Approx. measurements: 9 1/2" front rise; 31" inseam; 14" leg openings. Banded waist; darts in back fit through hips. Center pleat at front and back. Straight hems with side slits. A.L.C. "Hanson" sequined pants. Mid-rise; flat front. Side slip pockets. Fitted through straight legs. Full length. Hook/zip fly. Polyester; self lining. Dry clean. Imported. Model's measurements: Height 5'10.5"/179cm, bust 32"/82cm, waist 23.5"/60cm, hips 34.5"/88cm, dress size US 2. Cinq à Sept "Rosa" pants. Mid-rise; belt loops. Five-pocket style. Fitted through straight legs. Cropped above ankles. Split-front hem. Button/zip fly. Cotton/polyester/spandex. Machine wash. Imported. 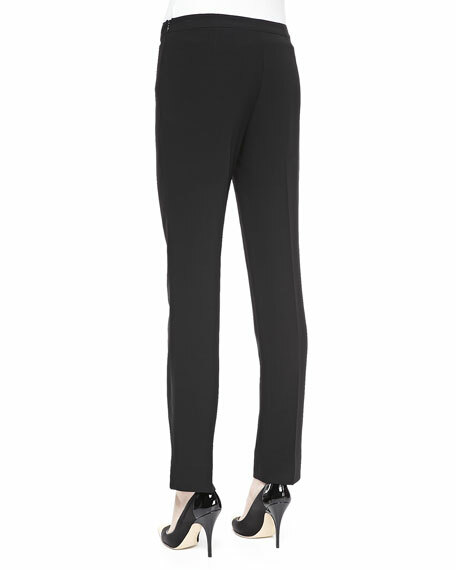 Diane von Furstenberg "Cruz" crepe pants. Mid-rise; pleated front. Sides slash pockets. Back welt pockets. Straight-leg fit. Full length. Hook/zip fly. Triacetate/polyester. Imported. Model's measurements: Height 5'9.5"/176cm, bust 32"/81cm, waist 25"/64cm, hips 36"/91cm, dress size US 2/4.